In order to make our journey to MQX work we need some help. The reason for two people in opening and closing slots is that the the quilt must be put up and taken down each day. It will be stored in a closet near the display space. If you are in a workshop and can be at our display space to assist with setup or take down, that would work also. The preference for two people at each table slot is to cover if one person is sick or has a change of plans. Please send a message to judy.naylor@gmail.com. Final details will be forwarded when our roster is complete. New members, please remember we will support you in any way we can. If you’ve not attended MQX, it is a wonderful experience. Make a day of it and have a great time. Thanks in advance to the 16 people who have already signed up for this adventure. This entry was posted in Raffle Quilt, Travel Schedule and tagged Raffle Quilt, Raffle Quilt at MQX. 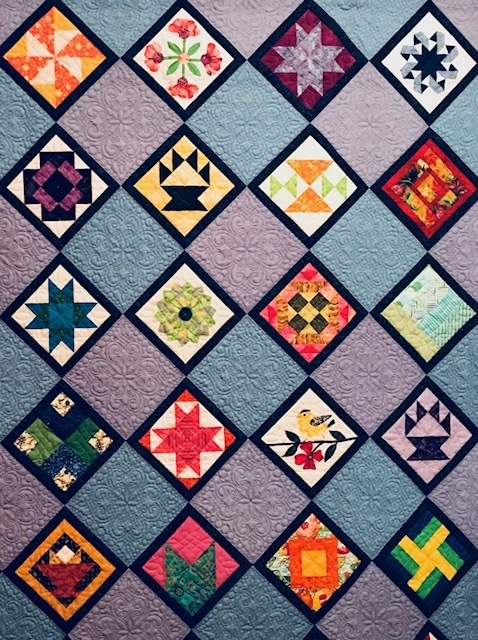 Thanks to all who signed up to sit with our quilt at the Connections Quilt Festival. We still need someone willing to white glove on Thursday, October 25th and Saturday, the 27th. If you can fill one of these slots, please contact Judy.naylor@gmail.com. We would also like more company for Ann Hockmeyer at Amesbury Open Studio Days, Saturday, November 11th from 12:00-2:00 and from 2:00-4:00. This entry was posted in MVQ, Raffle Quilt, Travel Schedule and tagged Connections Quilt Festival, Raffle Quilt. The raffle quilt will be traveling this summer and we need your help. From Thursday Aug 8- Sun Aug 10 it will be at the Lowell Quilt Festival which is held at the Lowell Memorial Auditorium. It will also be at the World Quilt Show held at the Radisson in Manchester from Thur. Aug 15 to Sun. Aug 18. This is a great opportunity for our guild to raise funds and we need your help with selling tickets and hostessing. The following are the available times and contact info. This is a great opportunity to see some wonderful quilts, do a little shopping and help your guild. This entry was posted in MVQ and tagged Lowell Quilt Festival, Raffle Quilt, World Quilt Show. Thanks to the great sales skills of Jan Taylor and the help of her support staff, Cathy Harnisch, Gloria Zacharias, Ann Stobbs and Carol Sullivan, our raffle quilt had a successful visit to Fabric Place Basement last Saturday and Sunday. Over the two days we made a total of $259.00. If you haven’t been to Fabric Place Basement in Natick MA yet, I recommend that you plan a visit. There are fabrics of all types from clothing to home dec and lace to leather and of course lots of quilting fabrics including batiks. For the knitters and crocheters there is also a yarn area. Peter, the owner, and his staff are friendly and helpful. Check their website www.fabricplacebasement for information, directions and coupons. This entry was posted in MVQ and tagged Fabric Place basement, Raffle Quilt.